The Royalty is claiming your birthright as heir to the kingdom of cash jackpots, so will you take up your mantel? Click here to play! There is plenty on offer at this exciting slot, so place that crown upon your head and start winning today! 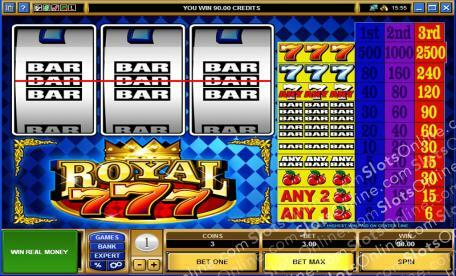 Royal Sevens is a three-reel slot played across a single pay line, and allows for up to three coins to be played at any time. Depending on the number of coins used each round, your payout on winning combinations will fluctuate. For example, if you win on triple Red Sevens with a single coin you will win yourself 500 times your initial wager. However, if you play and win with all three coins, you will earn 2500 coins back in winnings. There are no Wilds or Scatters to distract you from winning, just a stack of Cherries, Bars, and lucky Sevens to help you on your way to big jackpot success.